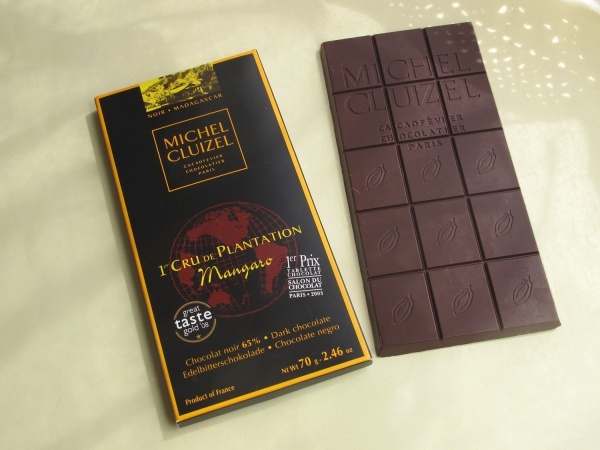 Mangaro is a chocolate produced in France using cocoa from the Mangaro Plantation in the Sambirano region of Madagascar. The cacao is grown on a former mango plantation and the resulting chocolate has a full, sweet and fruity taste typical to chocolate made with cacao from this region. Description on the package: Located on the island of Madagascar at the heart of the Indian Ocean, in the rich valley of the river Sambirano, this plantation flourishers on the land of a former mango forest. These beans have enabled me to develop a highly flavoured chocolate, blending aromas of exotic fruits, flavours of honey spice cake and acidulated hints of citrus fruits. Ingredients: Cocoa, cane sugar, cocoa butter, Bourboun vanilla pod. May contain traces of shelled tree nuts, milk and gluten. This page was last modified on 3 November 2011, at 06:51.